Whether you’re taking a week-long vacation to a beach paradise or just flying off for a few days in a distant city for work, you’ll probably want to take some cigars. 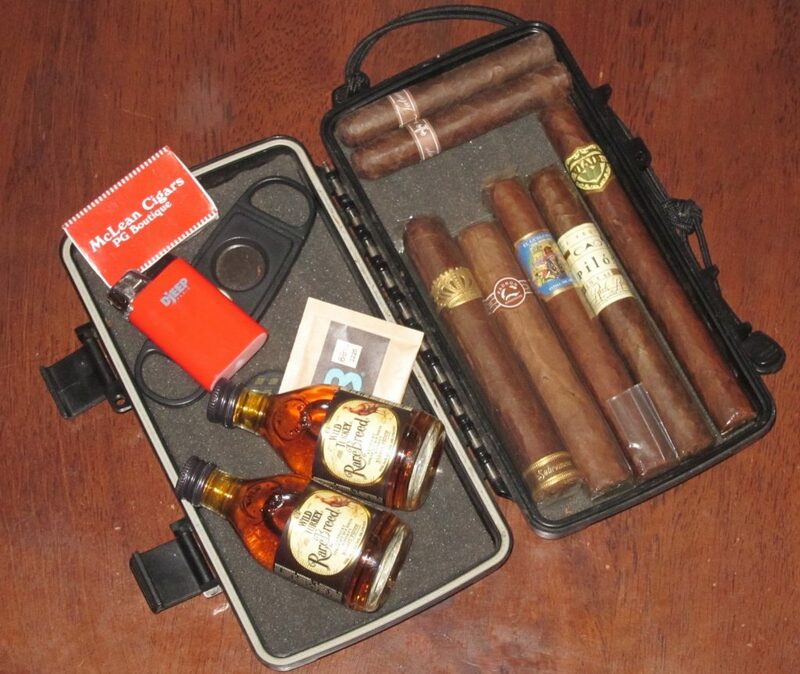 Depending on where you are going, you may not have easy access to a cigar shop. Or you may not have access to reasonably priced cigars (taxes can be very high in certain states and countries). Or you may only have access to Cubans, and you may not be sure of their authenticity. Torch lighters are great, but the TSA will take them from your carry-on or checked luggage. Trust me on this. I’ve accidentally left them in my bag and had them confiscated. But you can bring a soft flame lighter in your carry-on. You can also bring a single box of matches, so I like to stuff one box of wooden matches to the brim as a backup. My go-to soft flame lighter is the Djeep, which is dependable and has decent capacity. It’s also cheap, so if some ornery TSA agent on a power-trip takes it you won’t be too upset. If you really want a torch lighter, you might consider a Soto Pocket Torch, which can convert a regular cheap lighter into a torch. But bring the lighter in your carry-on and leave the Soto in your checked bag to make sure it isn’t confiscated if the TSA agent figures out what it is. Also, for all lighters and matches, know that other countries might have different rules (Nicaragua, of all places, is known for taking all lighters when you depart from Managua). So no matter what you bring, make sure it is something that, if push comes to shove, you won’t feel too bad about leaving behind. Travel is the perfect time to bring along that cheap cutter you got as a throw-in. And remember, if all else fails you can always cut your cigar with your fingernail; just don’t use your teeth. Unless you are heading to a country that doesn’t allow alcohol, there is nothing wrong with putting a bottle or three in your checked bag (though you may have to pay taxes on them). But what is often overlooked is that you can actually carry on booze in small amounts. When carrying on, alcohol is subject to the same rules as other liquids, meaning no container more than 3.4 ounces and all liquids must fit in a one-quart sized bag. Mini bottles (usually 50 ml.) are well under that limit, and you can fit five or six in one Ziplock. If you are planning on cracking these open on the plane, know that most airlines have a rule against alcohol not served by the flight attendants. Practically speaking, though, if you are discrete about it you probably won’t get caught. Never thought of bringing minis in through TSA before. I will try this on my next flight! I love Djeep lighters. They’re my favorite soft-flame disposable. A bit hard to find in my area, however. I thought up to 2 lighters or books of matches were OK for carry-on? I travel quite a bit and haven’t had a problem. I usually bring a $5 plastic double guillotine when I travel, just in case TSA decides to ignore it’s rules. As for booze, there is a limit (5 liters) on higher-proof spirits in checked bags, and you cannot bring on anything over 140 proof.